Wide arches are all the rage right now, and it doesn’t take much research to understand why. Liberty Walk, RAUH-Welt Begriff, and Sarto Racing to name a few are continually breaking the internet with race-styled road cars. From Honda’s unicorn NSX right through to the latest Italian supercars, nothing is spared from the wide-arch treatment. And its recent popularity is all thanks (in part) to a man called Kei Miura, otherwise known as Rocket Bunny Japan. There’s one main reason why this style is so popular right now; it SERIOUSLY looks cool! Rather than flaring arches or bolting ‘blister’ fenders (traditionally associated with drifting), Miura-san took inspiration from classic silhouette racers when creating his range of bodykits. Works-style cutaway arches revealing semi-slick tires, ducktail spoilers instead of monster rear wings, and pop-rivets used throughout, which just screams motorsport. Before long, Miura-san’s style was known simply as the ‘Rocket Bunny look’, and unless you banned yourself from all social media you couldn’t avoid seeing it. Being the JDM flavour of the month, it didn’t take long for Miura-san’s creations to start appearing worldwide. 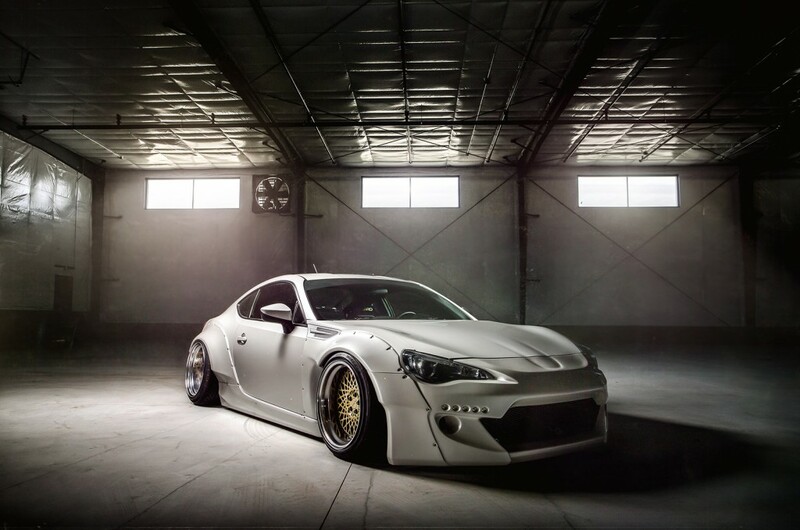 But unlike his own complete car builds, many companies and car builders worldwide focused solely on being the first to debut a new Rocket Bunny kit – creating maximum impact visually, but lacking in just about every other department. Your car’s exterior should be one element of a build, not the only element. This statement especially rings true with a group of Chicago-based drifters known as the Risky Devils. Bound by a mutual love for going sideways, Richard ‘Fish’ Fisher and the rest of the Risky Devils live for Japanese car culture. Don’t think they’re all about style of substance, either. Fish and the Risky Devils aren’t afraid to use and abuse their cars both on the street and at the track. Despite this gung-ho approach, authenticity remains the key for every Risky Devil build. Each upgrade Fish has made serves a purpose – be it improving looks or boosting performance – and once you look past the exterior, you’ll see one of the most comprehensively modified BRZs on the planet. There’s no getting past that exterior. 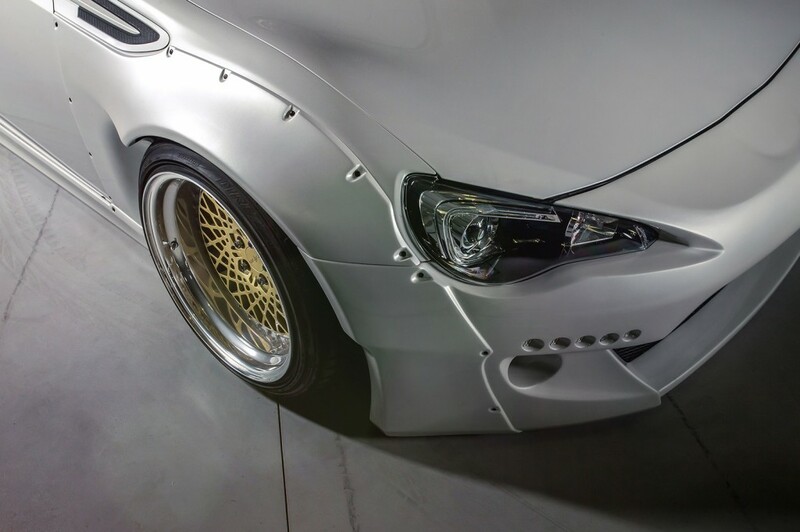 Miura-san’s Version 2 BRZ kit one of the best he’s every produced, and the epitome of what Rocket Bunny stands for. But look a little closer and you’ll notice Fish hasn’t opted for the traditional RB ducktail. Instead, he’s opted for a smaller option from Leg Sport in Japan – a design Fish preferred due to the overall shape and the perfect addition to separate his build from others. Take a look inside, and you’ll find that Fish’s love for JDM culture is even more apparent here. From the Key’s Racing steering wheel (produced by professional Japanese race car driver Takayuki Kinoshita), to the retro Recaro ‘confetti’ seats with matching chequered floor mats – Fish hasn’t just ordered the latest parts for the sake of it, he’s carefully chosen both new and old options to create his perfect road and track BRZ. In its standard trim, the BRZ isn’t blessed with huge horsepower – it’s one of the platform’s selling points, but also one of its downsides for drifters like Fish who are used to 300+bhp SR20s. With the FA20 motor still relatively unknown at the time of purchase, Fish opted for a Jackson Racing Stage 2 supercharger kit giving a much needed horsepower boost without the complexity of adding a turbocharger. Knowing full well the BRZ would be getting some serious use, Fish added a Setrab oil cooler, Jackson Racing intercooler and Koyo radiator to keep things cool. With Jackson Racing flashing the OEM ECU, the end result was a power increase of nearly 50% over stock. Then there’s the BRZ’s killer stance. 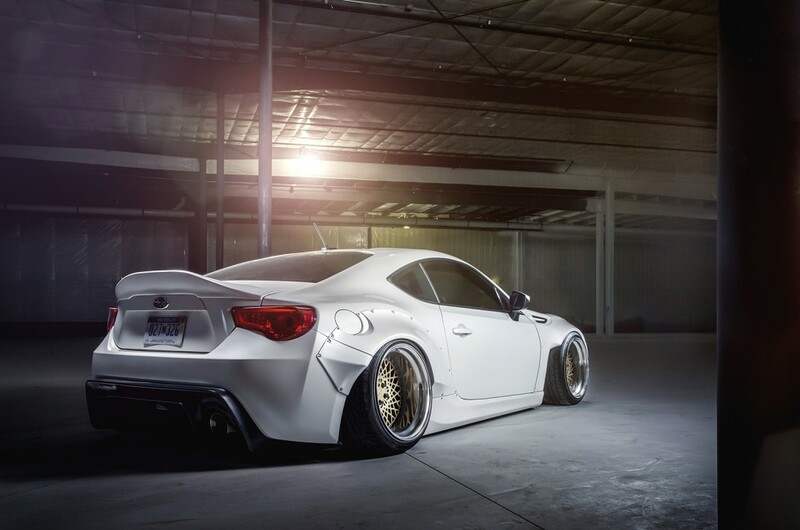 Sure it’s hella low, but this is one BRZ which gets driven HARD! 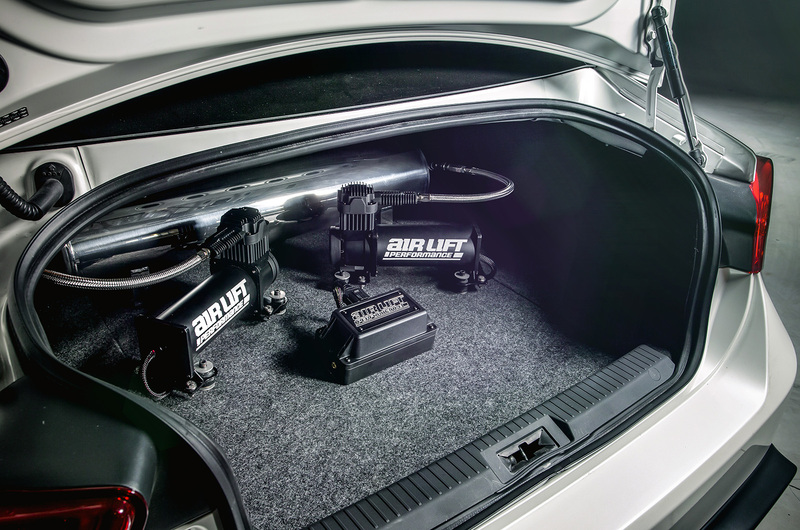 There’s only one answer when it comes to high-performance suspension combined with the ability to get low at the push of a button – Air Lift Performance. Fish opted for our Performance Series air suspension setup engineered for the BRZ – a system that features a bag-over-body construction (imagine a traditional coilover and replace with spring with an air bag) along with camber adjustable top mounts and damping-adjustable monotube dampers. The perks of this system means you can not only drive low, but also setup your car’s handling to perform on the street or track with a few simple clicks of the adjustor. In addition to the system, the latest Air Lift Performance air suspension control system was added, which provides visual feedback, mobile connectivity via Bluetooth for control and software updates, and the option for pressure and height sensing technology. 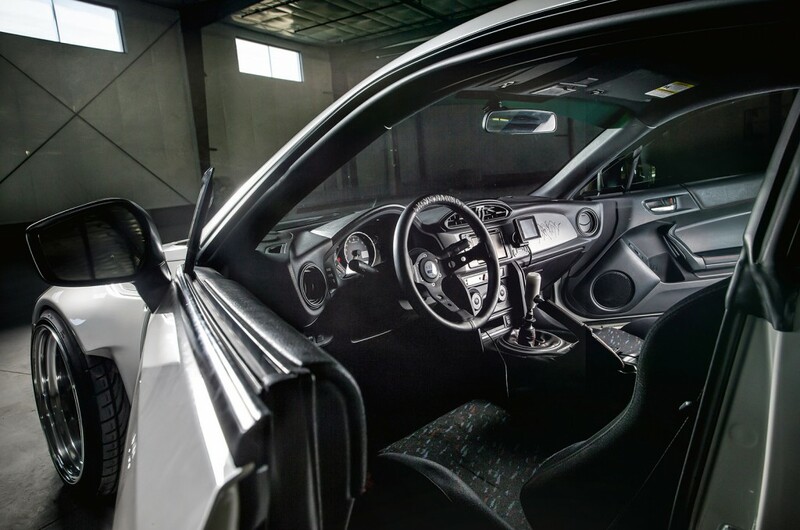 The streamlined design and full integration of the components allowed for a clean, low profile install; keeping tone with the look and feel of the BRZ. Fish’s BRZ is the end result of years of previous tuning; using tried and tested parts from around the world to create his ultimate drift-ready BRZ. From the outside, it may just look like another Rocket Bunny creation, but give him half a chance to unleash the power and you’ll know this car means serious business!